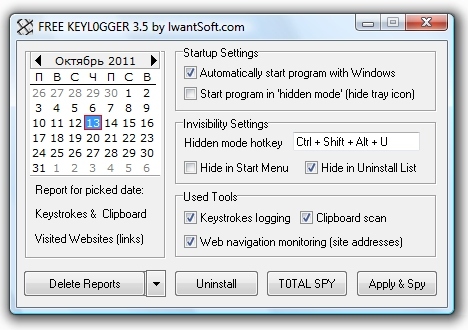 Keylogger builds a log of all the keys we press on our keyboard. 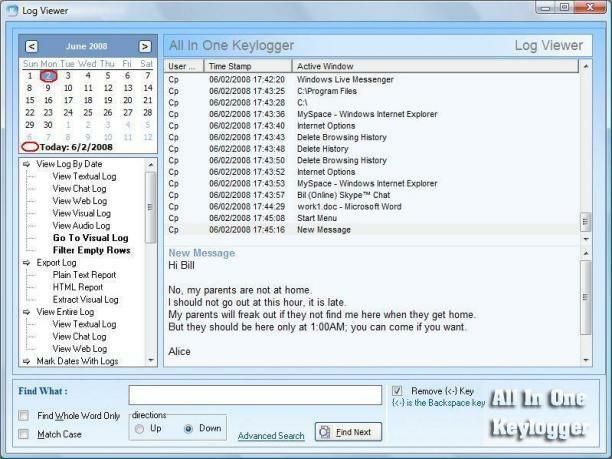 This log can later be reviewed to keep a check on the activities happening on a particular system. The bright side is that it can help in trouble shooting and analyzing employee productivity etc but on the darker side it can be used to hack someone's account for personal gains. Sounds horrible, doesn't it? But it can be helpful in knowing that what happens on your system behind your back and monitoring your system when you have kids is a good idea because we want them to be safe. 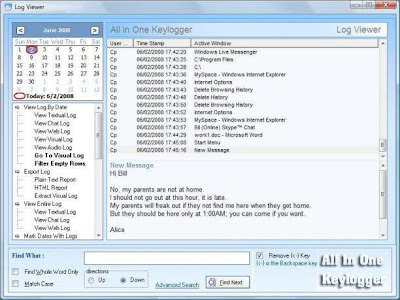 A keylogger can be a hardware or a software. Here is a list of keyloogers you can use according to your needs. It is invisible and works in the background recording every keystroke a user makes. It also tracks the launch of applications, sent e-mails and visited websites. It is small in size and is for low system requirements. In case the system is not responding it is capable of removing itself from the task list. Is is a little file with many possibilities. It works on Windows, Vista and XP. It can run on stealth mode and hence it is undetectable. Multi-lingual support lets you use it in any of the 6 languages like English, Spanish, Italian, French, Deutsch or Portuguese. It can also save screen captures in intervals you select along with monitoring of applications being used. As the name suggests it is free :) It can track and record keystrokes, clipboard activity, and Net surfing on individual PCs or networks (with administrative access). Report for activity on any day can be generated by clicking on date and other specifications. There is no 'help' option available in this software so you might need to use the information on internet to use it. 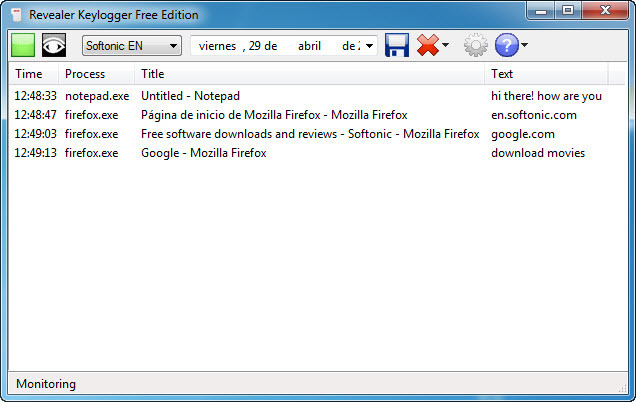 I has a simple interface and records the keystrokes and other activities in txt format. It does not store snapshots but can log any language. It can be seen active on the task managers. This is an all-in-one spy program. It intercepts everything entered from keyboard and monitors internet navigation. It also scans windows clipboards for changes and monitors the screen. It consumes less system resources and is invisible. 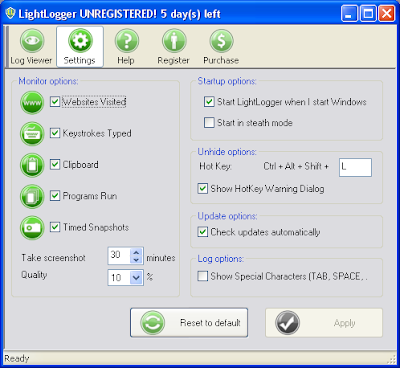 Do you use a keylogger? 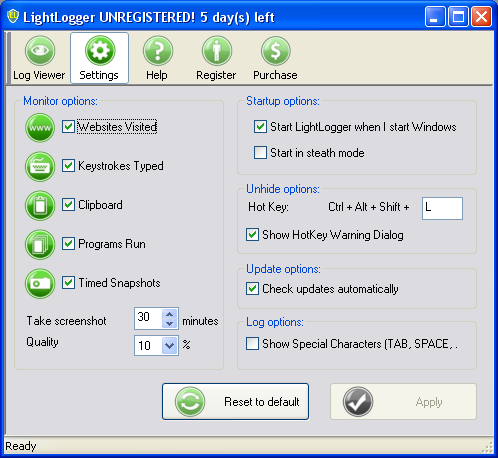 Do you think using a keylogger is a good option for monitoring the activities on your system while you are away? 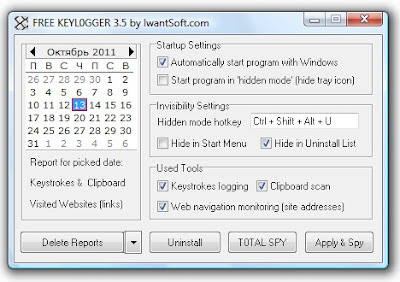 We would love to know about other keyloggers from you!